SHEIKH Abdullah Al Thani has reportedly put Malaga FC up for sale. The debt ridden club is being swamped by rumours over its ownership after Spanish radio station Cadena Cope revealed the Qatari Sheikh had held talks with multi-millionaire Rezart Taci, head of the Albanian petrol group Taci Oil, to sell the club. 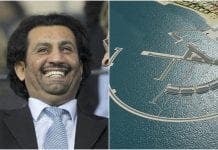 The decision comes as a surprise for many who had touted the Sheikh as a saviour of the Costa del Sol after he purchased Malaga FC two years ago, and announced plans for a new €400 million marina at La Bajadilla in Marbella. Now many fear that his other projects on the Costa del Sol could also be at risk. And the Mayor of Marbella, Angeles Munoz, is allegedly talking to the Ministry of the Environment to try and ensure the marina project goes ahead. However, Malaga FC has denied Al-Thani has pulled the plug on his investment. A statement on the club’s website read: “Malaga Football Club has started a process of internal restructuring within the organisation to adapt to the standards of financial fair play and with the intention of guaranteeing the self-sufficiency and sustainability of the organisation. “This process doesn’t mean the current owners have refused any type of investment. It follows an unsettling summer for the club with several senior players reporting the club for unpaid wages and other clubs claiming that payments for previous player transfers have not been met. Meanwhile Fernando Hierro has confirmed his departure from the post of General Director and Malaga and Arsenal have agreed the transfer of midfielder Santi Cazorla at €15 million. very sad this is for the guiri army who love their adopted team.only the spanish now in these economic times could upset an investor like this!!!! !